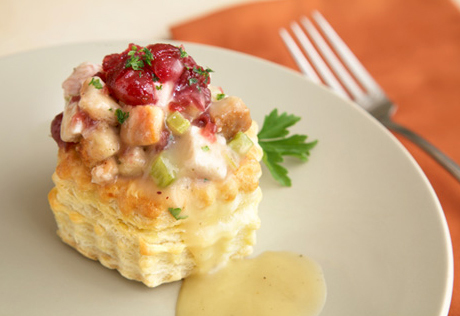 Stir the turkey, stuffing, 1/4 cup cranberry sauce and 1/4 cup gravy in a medium bowl. Spoon 1/3 cup turkey mixture into each pastry shell. Top each with 2 teaspoons cranberry sauce. Sprinkle with the parsley and serve with the remaining gravy.